Our product range includes a wide range of puzzle parking system, car driveway turntables, rotary car parking system and dual post stack parking solution. NANDAN's Multilevel Puzzle Parking offers a series of Horizontal and Vertical movement of pallets to accommodate multiple cars in puzzle like structure within the available parking area. This is an independent system, unlike the stack parking system and is fully automatic. These are self-supporting structures which is operated through Programmable Logic Controls (PLC). 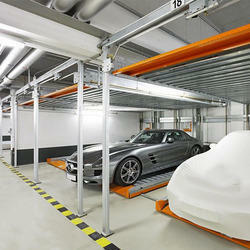 Parking is possible from 2 to 4 levels above the ground, or a combination of both above ground and underground. NANDAN's garage and Car Driveway Turntables are an attractive solution for tight or restrictive site conditions. We offer a diverse range of turntables for cars, trucks, specialty uses and the automobile industry. These turntables can provide easy building entry and exit for various vehicles. A NANDAN’s car turntable can be installed in a building, outside it, under it, beside it, even on top of it. Our vehicle turntables range from 3 meters to 30 meters in diameter with up to 100 ton capacity. 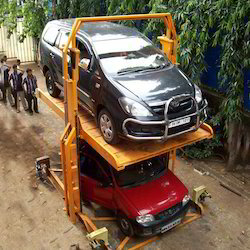 NANDAN's Rotary Car Parking System is similar to a giant wheel mechanism, Where vehicle is put in the cage or pallet, the same can rotate either clockwise or counter clockwise (bi-directionally) in rotary movements. Carousel design enables you to park either 7,8,10, or 12 vehicles in the space of only 2 parking spots. 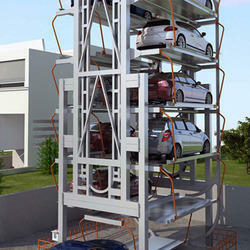 NANDAN's Dual Post Stack Parking Solution is the alternative to our Unipole Car Parking Solution for new buildings or existing societies where parking can be doubled. This type is designed to be fit on the surface and doubles the car space by stacking the cars one above the other. This has two pole mounted each side on surface of the Parking System, which makes easier for heavy cars like SUV’s to be parked above the stack. The Car on the ground level will need to be moved out before parking/ removing the car on the raised Platform.